National Coalition of Independent Scholars is a 501(c)(3) non-profit organization providing professional affiliation, support services, and camaraderie to scholars outside of tenured academia. Although based in the United States, our membership and activities extend internationally, and by January 2017 NCIS Full and Associate members comprised over 200 scholars in fifteen countries in Europe, Asia, Australia as well as Canada and the Americas. Membership is open to scholars across all disciplines. NCIS assesses the qualifications of each membership candidate for intellectual contribution, scholarly rigor, and independent status prior to acceptance. Our next international conference will take place at the University of Massachussetts, Amherst, 21-23 June, 2019, on the theme "Making Connections, Meeting Challenges". NCIS is an affiliate of the American Historical Association and a member of the The Alliance of Nonprofits. University of Massachusetts, Amherst, U.S. 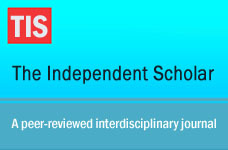 The Independent Scholar (TIS) is the NCIS online peer-reviewed and open access journal. All members of NCIS, and members of NCIS-affiliated "Partner Group" organizations are eligible to submit manuscripts to TIS for peer review. Check Submission and Review Guidlines.